Spring in beautiful North Lake Tahoe is one of the most delightful times of year! The wildflowers are in bloom, everything is turning green, and the fresh scent of the earth is beginning to waft up. This is a time to bask in the elements and celebrate nature. Earth Day is April 22, and to honor Mother Earth, we are sharing our green initiatives with you. Going green: when we bought Cedar Glen Lodge almost 6 years ago, there were many things that needed updating. It was very important for us to make changes that would not only be visually pleasing, but also environmentally responsible and sustainable. We renovated our beautiful property using reclaimed woods and materials that are native to this area. We dramatically cut down on our energy usage by replacing everything from light bulbs to electric appliances and windows with energy efficient fixtures. Additionally, we only use low-flow plumbing appliances and have re-circulating pumps to provide instant hot water in all our faucets. After our renovations, the Tahoe Regional Planning Agency (TRPA) awarded Cedar Glen Lodge the “Best in Basin” Commercial Project Award. This award recognizes projects that demonstrate exceptional planning, design, and compatibility with the Lake Tahoe and human environment while following the guidelines set forth by the agency. Later on in 2014, TripAdvisor named Cedar Glen Lodge amongst the 10 highest-rated green hotels in the USA. Frankly, this was a big and happy surprise to us, and we felt a huge responsibility! This triggered the question: what else can we do to improve our eco-friendly practices? 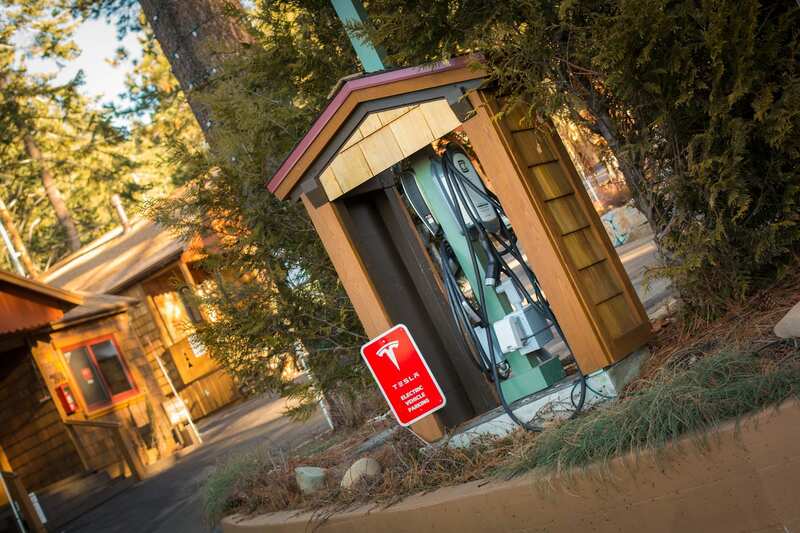 So, this is how Tesla and an EV Charging Station came to our property. These changes made us very happy, but still we didn’t feel completely satisfied. It was pretty upsetting to see all the empty plastic water bottles left behind by our guests, and even worse, our own plastic waste! On any given day, we would dispose up to 100 small plastic bottles containing shampoo, lotion and conditioner. Refilling them is not a viable option! Surely, there are companies that clean this waste and re-use the soaps sending them to developing nations, a very noble idea indeed; however, our approach went beyond that. Instead of trying to alleviate the problem, we decided to simply stop creating it! Fortunately, simple thinking pays off. 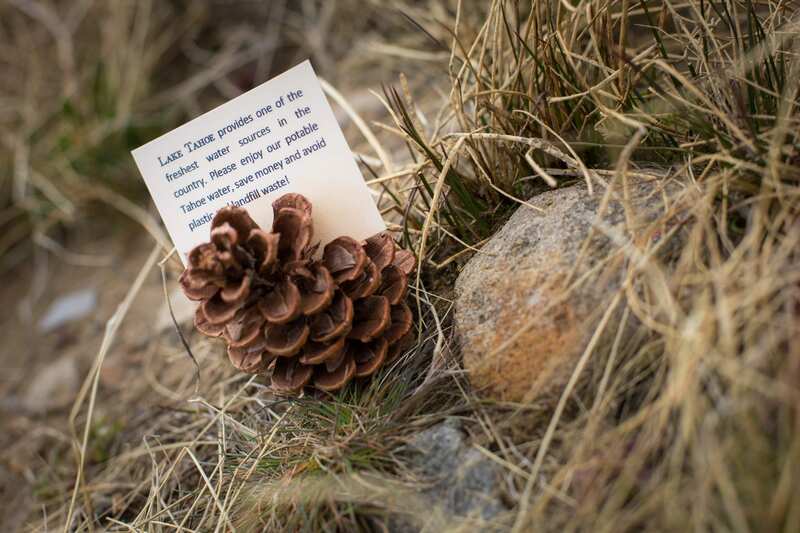 By placing this beautiful pinecone sign in our rooms, our guests are participating in our eco-friendly efforts and we rarely, if ever, see plastic bottles left behind… and it just got even better! On February 10th, Lake Tahoe won a national tap water tasting award. The National Rural Water Association (NRWA) announced Glenbrook, Nevada the winner of the 2016 Great American Water Taste Test. Now all of our suspicions are confirmed; this IS the best drinking water in the country! And as for our toiletries? Well, now we have a refillable spa quality and eco-friendly system from Gilchrist & Soames! The post Cedar Glen Lodge offers a green escape in honor of Earth Day appeared first on Go Tahoe North.